It’s one of the toughest jobs: to keep all your company’s marketing and communications on message. 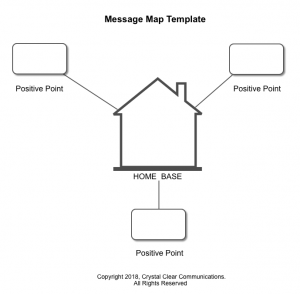 To keep your company on message, boil your message down to one page with a Message Map. How can you keep your content marketing always on message and consistent in the face of multiple challenges? Address multiple audiences, such as customers, partners, distributors, employees, influencers, and investors. Work with various bloggers, agencies, spokespersons, writers, and videographers to create content. Create content in separate business units, sales, geographic regions, and department silos that don’t even agree on what the message is. Create content across many media – digital, social, events, videos, printed, earned media, and more. Chunk out content that’s consistent in various serving sizes – 7 seconds, 2 minutes, 5 minutes, or 20 minutes. Do these challenges sound familiar? CEOs, executives, marketing, public relations, and investor relations people face these challenges every day. My late friend Tripp Frohlichstein and I co-invented Message Maps in the 1980s. Since then, we’ve taught Message Maps to thousands of marketers and communicators. Companies of all sizes use Message Maps, including entrepreneurial ventures like The Republic of Tea and giants like AT&T and Intel. I teach how to make Message Maps in marketing workshops for the Association of National Advertisers. At Content Marketing World, I shared Message Maps in a presentation (slides 35-39). How to co-create, use, test, and refresh Message Maps to keep your company on message. A Message Map helps you say it, share it, tweet it, blog it, post it, publish it, or debate it well. By using Message Maps consistently, you can make your marketing, employee, and investor communications even more harmonious and successful. Message Maps help you to display a command of the facts, stay crystal-clear, and tell the same company story consistently. The average American’s attention span is about 8 seconds. If your company is quoted in news media, the average sound bite is about 7 seconds or 23 words. To maximize sharing, the optimum length of a post on Facebook is 15 words. On LinkedIn, it’s only 9 words, a BuzzSumo study found. If you can’t tell your story in 7 seconds, you probably won’t get to tell it at all. A clear, concise, consistent marketing message wins people over. Start by creating one overall, top-level Message Map for your whole company. Work with an experienced Message Map facilitator to co-create and gain buy-in for your company’s message in a half-day workshop with your CEO and top executives. 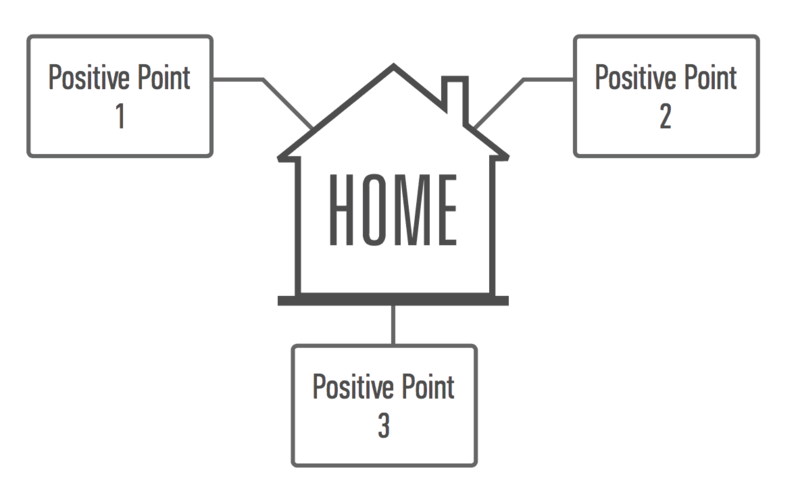 Your main message, home base, is supported by 3 positive points. In turn, each positive point is supported by 3 proof points. Home base, in the center of the map, is your main message. It must answer the question, “What’s in it for me?” as seen through the eyes of all stakeholders. 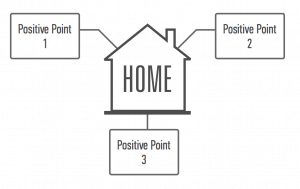 To support home base, add 3 positive points. You need at least 3 points to support the home base message well — and no more than 4 points. 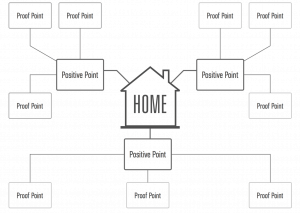 To support the positive points, add 3 proof points to back them up. 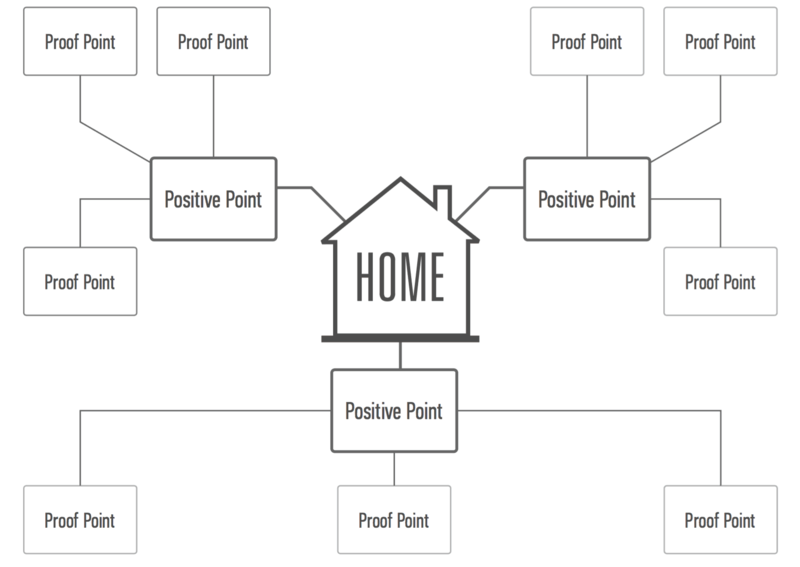 To support your proof points, add examples, quotes from customers, image, facts, and figures. Include differentiating points: What makes your story different? What can you say that competitors can’t say? These often are the hardest elements to ferret out — but they make your message far more powerful. 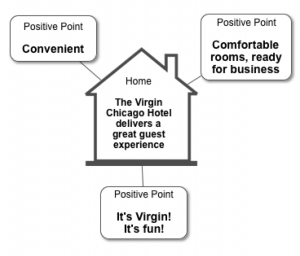 Show an example of a Message Map like this one for the Virgin Chicago Hotel. Here’s an 18-word message about a hotel I often stay in: The Virgin Chicago Hotel. 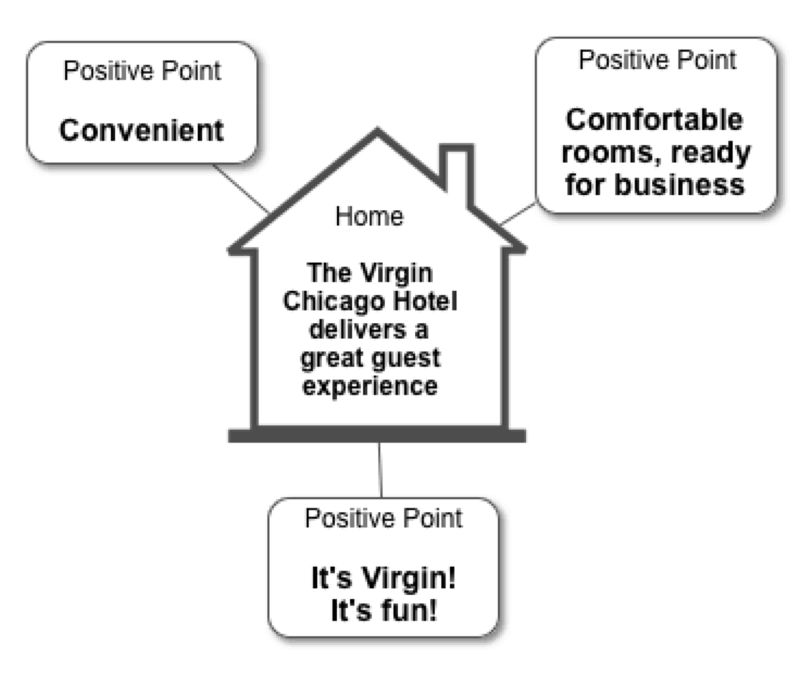 It delivers a great guest experience (home base) with a convenient location (positive point), comfortable rooms, ready for business (positive point), and “It’s Virgin! It’s fun!” (positive point). 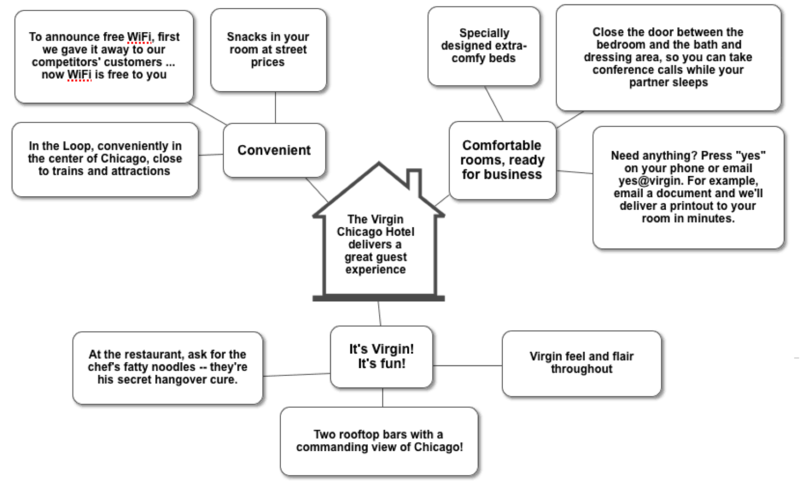 Here’s a basic Message Map for the Virgin Hotel Chicago — its whole story in 18 words or 6 seconds. Now that you’ve primed the pump, your executives each create a Message Map about your company individually. 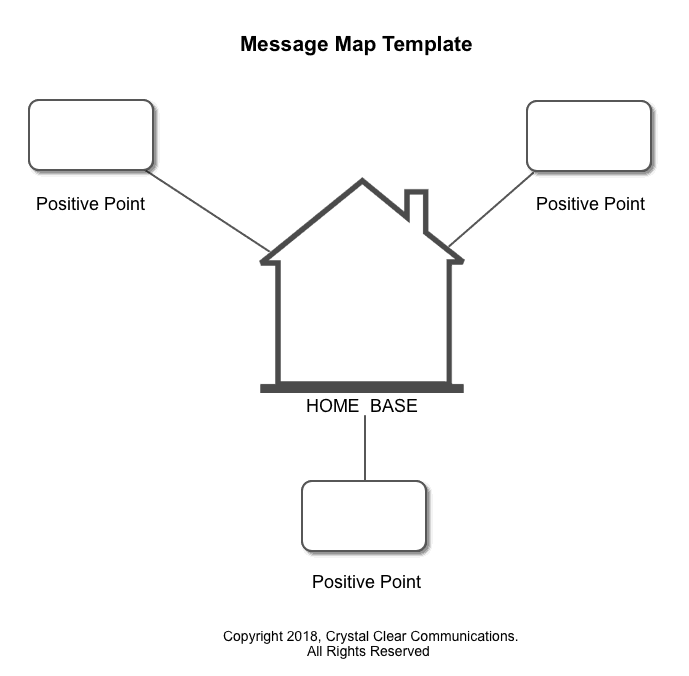 Here’s a template to help you create a basic Message Map. For more ideas to keep content marketing always on message, subscribe to our blog. The facilitator then posts all the resulting Message Maps on the wall. Each message creator reads his or her message out loud to the team. They all tell different stories about the company. Some of the stories don’t even sound like they come from the same company. The company has an unmet need for one unified story that’s relevant to all its audiences. Up to now, the company has never had a simple tool to help it tell its story and teach it to others. These realizations always lead the executives into an intense discussion. Their focus: which parts of the story work and which don’t? On a whiteboard, the facilitator takes the best parts of each participant's story to map out one story that's co-created by the team. Then the haggling begins. With only 23 words to work with, the execs debate each and every word. Passionately, sometimes even furiously. They find exactly the right words to tell your company's story. Make your message the optimal size for humans. Multiple messages confuse people, so forget about them. Invest all your energy and budget into supporting one message about your company. Once the executives agree on a home base and 3 positive points, they've created an optimal-sized message for humans. Neuroscientist Dr. Carmen Simon notes that people can only absorb one main message at a time, supported by 3 or no more than 4 positive points. 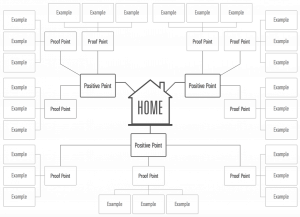 Once the home base and 3 positive points are agreed on, add detail to your Message Map by adding proof points. Virgin Hotel's Message Map adds proof points to flesh out the message. By the end of the workshop, the executives will co-create a first-draft Message Map. After the workshop, have them review the Message Map, check the facts, and polish it up. Then, you will need to do the legwork to add stories, anecdotes, and more examples to create a full-scale Message Map. Give yourself a journalist's license to pursue the story. Ferret out the company's best anecdotes, and add them into your Message Map. Include differentiating points -- things your competitors can't say. Now, you have a robust message that is ready to serve as the foundation for all the communications and content your company creates. That's the power of a Message Map! 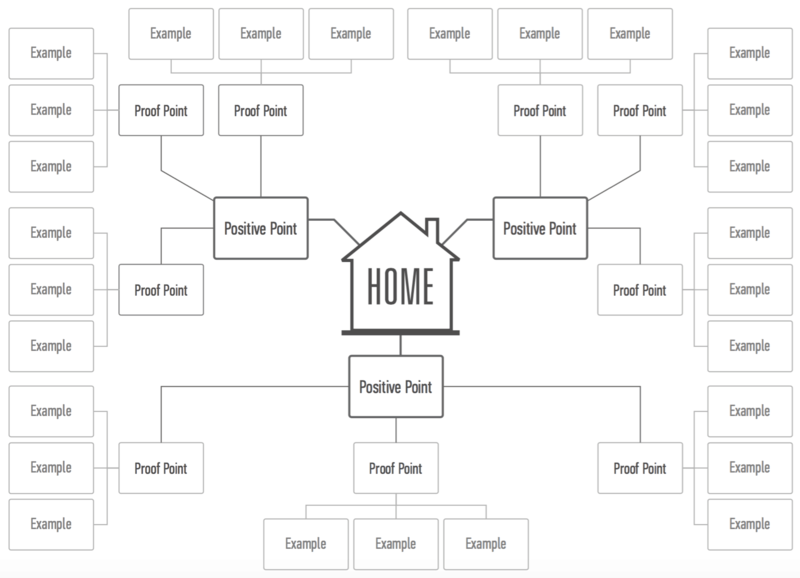 Here's the anatomy of a fully built-out Message Map with a home base, positive points, proof points, and examples. Before you roll it out, take the time to test your Message Map by using these 10 tests to assure its relevance and resonance with your audiences. Keep your company message clear, concise, and completely consistent. With your company's Message Map in hand, you can build all your marketing, communications, and investor messages with utter consistency. Use the message map to train sales, marketing, service, and other employees on how to deliver your message consistently. When everyone uses the same message, it's like everyone in the choir singing from the same song sheet. Such harmony! 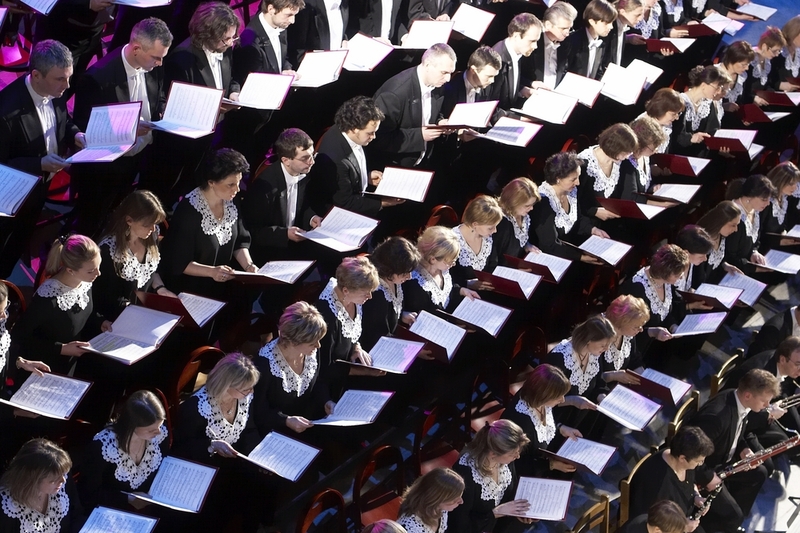 A Message Map gets everyone in your company on the same page, so your message is backed up by the whole choir. Keep your Message Map fresh! As time goes forward, add new products, customer wins, market expansions, events, and examples to your Message Map. Update it at least quarterly to keep the message fresh and current. Build a whole library of Message Maps for your company. Use this same process to create a Message Map for each product or solution your company sells. To create Message Maps for business units, product lines, products, services, and geographical regions, convene the relevant product managers, R&D, sales, marketing, and other participants to co-create a Message Map. Have a facilitator drive the process. When you co-create the message, everyone shares a stake in its success. Tripp used Message Maps to prepare executives for news media interviews, presentations, speeches, and by-lined articles. I apply Message Maps to those jobs plus marketing, websites, videos, infographics, annual reports, earnings releases, news releases, collateral, magazines, trade shows, employee communications, and more. Tripp and I co-created Message Maps for companies such as AT&T, McDonald's, R.R. Donnelley, TeleDanmark, Ameritech, and Tellabs. We showed that Message Maps can scale to fit any size organization – from a one-person shop to a small nonprofit, to medium-sized business, to a Fortune 500 company. To address the different people in your audience, color-code your Message Map for each buyer persona. Particularly where multiple buyers are involved, you will need to color-code the relevant message elements. Start with a black-and-white Message Map, then color code message elements for each audience. For example, you can use the same Message Map and highlight it in blue for technical buyers, red for financial buyers, and green for environmentally focused buyers. Only share the parts of your message that are relevant to each buyer persona. Don't bore anyone with information they don't care about. How can a content marketing flying solo make the biggest impact with limited resources? How to deliver consistent content marketing messages to all buyer personas? How to keep content marketing always on message? How to link specific content marketing activities to sales? How to speed the buyers’ journey to a purchase? How to help buyers take the first step in the buying journey? How to measure meaningful web traffic and give content marketing the credit for it? What content marketing appeals to customers? What brings them back? For more ideas to keep content marketing on message, subscribe to our blog.